The next day Jimmy stared to a big tree, that tree was just the right size to be Clown disguised to tickle those squirels on his branchs. One day Jimmy whispered to the next door Granny, “Don’t step on that rock, his hiding waiting to wet an ant with his flower”. Granny asked him what was going on and Jimmy explained that Clown hadn’t disapeared and he was just playing around as he always does. Some days later Granny saw Jimmy again, he was looking down quietly so Granny aproached him. He told her that “Maybe Clown really disapeared ’cause nobody smiles or laughts anymore”. “¡Clown didn’t disapeared! ¡He just had so much laughts and had such an amusing life that his body thought it was enough and the only ones left to play pranks and tickle were the ghost so, he just went to see if he can make them laught by being one of them!” Then Granny touched Jimmy’s shoulder from behind, and Jimmy jumped so fast that Granny couldn’t avoid laught so hard that her fake teeths hit the ground. Both stared to the teeths that looked like they were smiling and laughted together. 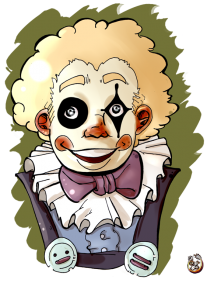 Lots of days and nights have gone and come for Jimmy and his teeth are as fake as Granny’s teeth and yet once in a while he catches a glimpse in the corner of his eye or a cold breeze hits his neck he laughts out loud because he knows that it’s just Clown playing pranks to him again. Escrito el 20 de junio de 2011 y modificado el 22 de septiembre de 2013. Licensed under a Creative Commons Attribution-NonCommercial-NoDerivs 3.0 Unported.